What broadband technologies are currently supported by Bandwidth Commander? Bandwidth Commander currently supports DOCSIS networks only. Is Bandwidth Commander allowed under Net Neutrality rules? 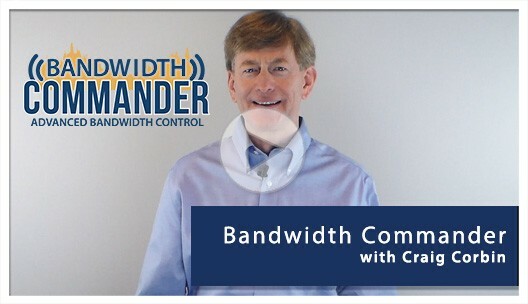 The FCC Net Neutrality rules allow for reasonable network management, and Bandwidth Commander gives you a way to manage your bandwidth in a net-neutral fashion. Bandwidth Commander is a high-performance platform that combines real-time processing of subscriber usage data and network conditions with policy-based service management applications so that broadband providers can manage subscriber bandwidth consumption and improve network utilization while remaining compliant with net neutrality. Unlike some devices that employ deep-packet inspection (DPI), Bandwidth Commander does not look at the type of traffic, and it does not look at the source or destination. It can manage traffic fairly based on parameters like monthly or daily quotas and peak time usage. If you have any specific questions regarding bandwidth usage management policies as they relate to Net Neutrality, please consult with your attorney. How accurate is the subscriber usage calculated by Bandwidth Commander? The usage data from Bandwidth Commander is very accurate. Bandwidth Commander uses the IP Detail Record (IPDR) protocol, which provides a standard framework for collecting subscriber usage and network instrumentation data in DOCSIS networks. Bandwidth Commander collects, processes and stores IPDR data streamed from CMTSs and also performs a series of checks and cross-checks to validate the completeness and correctness of IPDR data to detect anomalies that can result in the computation of inaccurate Internet usage data. Mediated usage data computed from IPDR records is considered “billing grade” and serves as the foundation for usage-based service management applications. Bandwidth Commander’s underlying platform has been lab tested to verify the accuracy of IPDR service flow counters compared to a total amount of actual data traffic. What kinds of bandwidth usage policies can I implement? Bandwidth Commander is very flexible, and allows you to create usage policies that enforce quota management over a period of time, such as a monthly quotas and hourly sliding windows, peak-demand management during times when the network is most congested, and top talker management. This allows you to manage bandwidth demand to improve the quality of experience for your subscribers or to deliver usage-based service plans.